It was the chance for the Year Seven and Eight to showcase their Football Swagger as they displayed passing, heading and shooting skills. The Primary schools had great control of the ball showing attacking skills, heading techniques and dribbling skills. Overall the schools improved dramatically from the first round highlighting the valuable opportunity to nurture the next generation in developing and fostering their love for the game. Tahiri Elikana, CIFA Development Officer said the second round of the Cup Competition went really well. “There are lots of talented players and some exciting matches were played. All the primary schools involved enjoyed the experience,” says Elikana. 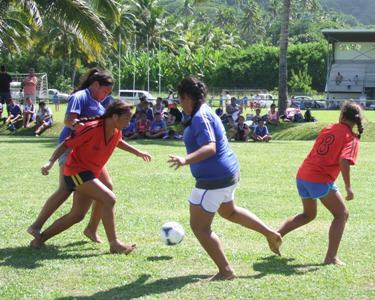 Cook Islands football is fun, imaginative, creative and the success and happiness of the young aspiring players are fuelled by their support team. The support from the parents, teachers, coaches, principles and teams cheering the players on, created the feeling of exhilaration, fun and energy. Join the Primary Schools and support the biggest participation sport and Play Football in 2014.